Graphene is a highly prized material due to its ultra strong, flexible and lightweight qualities, but producing it at large scale has been a challenge. A team of researchers led by the National University of Singapore (NUS) claims to have come up with a way to more efficiently produce graphene, thus making our graphene future ever more attainable. Traditionally, graphene is harvested from graphite (yes, the same stuff in your pencil) using sound energy or shearing forces. The graphene is then thrown into an organic solvent to disperse the layers. Simple enough, right? Wrong. See, graphene tends to reform back into graphite once in the solvent. According to The Engineer, current production requires at least one tonne of solvent to yield one kilogram of graphene. Not exactly cost effective for businesses or good for the environment. The NUS team's technique supposedly cuts the amount of solvent needed by up to 50%. The first step is to exfoliate pre-treated graphite under a highly alkaline condition. This prompts the graphene to cluster in a slurry – no additional solvent required – plus throws in electrostatic repulsive forces to keep the graphene layers from reforming into graphite, for good measure. "Our technique, which produces a high yield of crystalline graphene in the form of a concentrated slurry with a significantly smaller volume of solvent, is an attractive solution for industries to carry out large scale synthesis of this promising material in a cost-effective and sustainable manner," said Professor Loh Kian Ping of the NUS Faculty of Science. 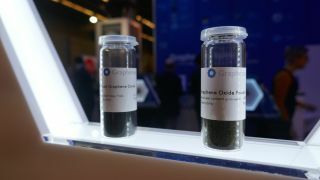 We'll have to wait and see if this method makes it into large-scale production, but it's a promising breakthrough as tech and other industries look to graphene to produce a new wave of ultra durable, highly conductive and incredibly lightweight products. Graphene truly is disruptive technology with applications in everything from smartphones to batteries to sports cars. Chances are, a large sector across the business and manufacturing world is eyeing this latest development closely.